Mentor, Ohio is a new and small residential community located within the city suburbs of the city of Mentor in Ohio. The community is characterized by the quiet atmosphere that enables the residents to experience a unique and quality lifestyle. Additional features that make Mentor an excellent place to live is it having quite affordable and attractive houses, extremely low crime rate, proximity to the big city of Mentor, spirit of cooperation among the residents, state of the art social services and quite a big and naturally appealing recreation park. Mentor offers a special blend of housing to fit the needs of different people. These range from the very upscale housing to the contemporary as well as the charming century homes. Examples of available housing for both rent and sale include apartments, condos and single family homes most of which are detached. There also is housing for the elderly that includes the Salida Woods and Emeritus Assisted Living among others. With the community being located in a rural-like environment, a lot of attractions and activities are mainly outdoor. Most of the residents living within and around Mentor have horse ranches hence making horse riding one of the top most favorite activities of the residents. There also are a couple of shopping centers, cafes and restaurants. This is one of the few remaining places in America where you can enjoy a delicious meal made from all natural products. In addition, there are quite a couple of other activities like golfing as well as swimming in the nearby Mentor public beach which is the largest in Ohio. Also, there’re various water related activities such as boating, canoeing and fishing that the residents find pleasure in. Education is highly valued within this community and although there aren’t any schools within the community, there are quite a couple of them nearby. In total, there are nine public elementary schools within the area and these include the Fairfax, Bellflower, James A. Garfield, Hopkins, Brentmoor, Sterling Morton, Dale R. Rice, Lake and the Orchard Hollow Elementary Schools. The three middle schools include the Shore, Ridge and Memorial Middle Schools and the only high school is the Mentor High School. In addition, there are four private and one special care school. These include the St. Mary’s Mentor, Lake Catholic High School, Mentor Heritage Christian Academy and the Mentor Christian School. The road network within and around Mentor is in very good condition. Other than the roads and streets, there are quite a number of bike paths as well as sidewalks. All homes are provided with clean water as well as garbage collection and recycling services for their yard waste. Furthermore, there are fire and police departments within the area. Reasons why living in Mentor, Ohio is worth is because the community is well and tightly knit, the security is very high, housing is affordable, getting a job is pretty easy and as for the elderly or residents earning a low income, financial assistance is offered. Mentor on the Lake, Ohio is less than 2 square miles in area, but it houses around 7,500 residents. It has a few parks and recreation centers, many businesses who are looking to hire, and great area schools to educate your children. 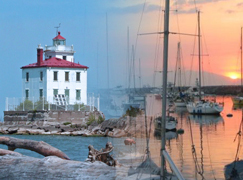 Being so close to Lake Erie has its benefits and helps to make this a great place to live. Parks are beneficial to the residents of an area because they help to reduce crime and give the residents a positive area to spend their time in. John R. McMinn Memorial Park has a soccer field, three baseball fields, a basketball court and also playground equipment available for use. Andrew Road Field, which is located behind City Hall, has two soccer fields, two baseball fields, and includes playground equipment for the younger children. Overlook Beach Park offers visitors a basketball court, picnic area, gazebo, playground equipment, and a wood deck with staircase at the edge of the water of Lake Erie. With these three parks in roughly a one mile radius, it should not be hard for residence to walk to one of these recreation areas to enjoy the amenities they have. The unemployment rate for the area is around only three percent which is below the national average. Many businesses in the area are available offering a wide variety of occupations for the residents in the area. 7-Eleven, AAA, ADT Security Services, A Sudden Urge Tattoo, AAMCO Transmission, Aaron’s, Advanced Auto Parts, Allstate, American Family Insurance, Applebee’s, Arby’s, Auntie Anne’s, AutoZone, Best Cuts, Big Lots, Tommy’s Subs, Lake Maintenance and Construction, Great Lakes Home Improvement, D’Amico Law Office, Bock’s Floral Creations, and Giant Eagle are just a few of the area businesses that are willing to hire area residents. The children of Mentor-on-the-Lake go to schools in the Mentor Public School District. This includes nine elementary schools by the names of Bellflower Elementary, Brentmoor Elementary, Garfield Elementary, Fairfax Elementary, Hopkins Elementary, Sterling Morton Elementary, Rice Elementary, Orchard Hollow Elementary, and the only school actually in Mentor-by-the-Lake, Lake Elementary. There are three middle schools in the area which include Memorial Middle, Shore Middle, and Ridge Middle Schools. One high school serves the Mentor-on-the-Lake and the Mentor area which is Mentor High School. Jacqueline A. Hoynes is a specialized school for individuals with autism. There is over a 97 percent graduation rate for students that attend these schools and they have received the “Excellent with Distinction” award from the state. For seven years straight the schools have gotten a rating of “Excellent” on the accountability report issued by the state. There is a 1,500-seat auditorium which includes a classroom complex as well called the Mentor Schools Fine Arts Center. The district houses various theater events and concerts and is available to rent to promoters and organizations as well.